Update (4/8 1:00pm): Amazon has matched this deal and now also has the Seagate Expansion 4TB for $129.99. 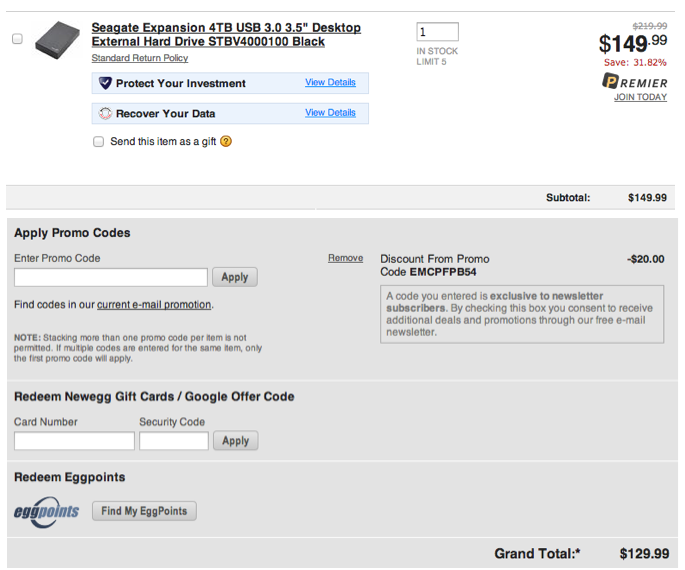 Newegg offers the Seagate Expansion 4TB USB 3.0 Desktop External Hard Drive (model STBV4000100) for $149.99 and promo code EMCPFPB54 drops it to $129.99 with free Super Eggsaver shipping. Today’s deal matches yesterday’s (now expired) Amazon Gold Box promotion and is within $10 of the best price ever. This 3.5″ external drive features ample storage for full-system backups, fast data transfer rates with USB 3.0 (backwards compatible with 2.0), and a built-in power management system. Rated 4.1 out of 5 stars from 2,063 Amazon reviewers.